RUNNERS from the Henley area raised thousands of pounds for charities by taking in the London Marathon on Sunday. 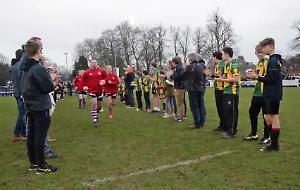 Dot Adamson, from Binfield Heath, and her son Jack were running in memory of her husband Euan, who died while playing rugby for the Henley Wanderers in 2008. She finished in four hours and 14 minutes and 30-year-old Jack came home in three hours and 20 minutes. The duo raised about £8,000 for Cardiac Risk in the Young, which included a bucket collection at Henley Rugby Club. Mrs Adamson, a former teacher at Gillotts School in Henley, called her race experience “amazing”. The noise helped her keep going and forget about an Achilles injury. “I wilted a bit towards the end,” she said. “It was rather warm, which made it difficult. I am an early morning runner so in the summer I dont get the heat. The pain in my ankle probably took a few seconds of each kilometer at the end but I was absolutely delighted with my time.” Mrs Adamson said Jack suffered with cramp towards the end of the race and was a “little bit disappointed” with his time. Anna Moran was left on crutches after aggravating an injury in her left knee while running with her sister Allison Bennett. She finished in six hours and four minutes after also pulling her right hamstring near the start of the race. Mrs Moran, a former Gillotts School pupil, said: “I have been having treatment for the injury to suppress it but the only way of relieving it is with physio or, in some cases, surgery. It started to play up after only one mile and, probably because of my running form was poor, the hamstring then went in my right leg. Her sister finished in five hours and seven minutes and together they raised £2,240 for the ChildLine Schools Service run by the NSPCC. Beatrice Friend, of Greys Road, Henley, finished in four hours and three minutes and raised £1,500 for the Autistica charity. Beatrice Friend, of Greys Road, Henley, finished in four hours and three minutes, and raised £1,500 for the Autistica charity. She said: “The crowd support was amazing from the first mile right until the end. I was a bit worried about the heat but I got over that by pouring water over my head and running through these amazing misty showers. I ran quite an even race. I had to hold myself back in the first half because it is tempting to go too fast because of the crowd and the adrenaline. I did about nine-minute miles until halfway I tried to go a bit faster but it was too hot.” Mrs Friend said knowing that her husband Rob and seven-month-old daughter Matilda were waiting for her at the finish helped keep her going. Kelly and Ian Hargreaves, of Newtown Gardens, Henley, ran this years marathon together in five hours and seven minutes. It was the second year running they had taken part in aid of the Juvenile Diabetes Research Foundation. Their nephew Harri Douglas, 14, from Binfield Heath, fell ill suddenly in December 2011 while they were looking after him. The teenager has since made a full recovery. This year the couple raised more than £4,000. Mrs Hargreaves said: “It was fantastic. It was hard because it was a hot day which made running difficult. Former Gillotts School and Henley College pupil Olly Wehring completed the marathon in four hours and 38 minutes. He said: “Im a little bit disappointed with my time, although it was an amazing day. He raised £3,600 for the Born Too Soon charity, which helps families with premature babies. He and his wife Jos son Conor, three, was born eight weeks premature, weighing 3lb 8oz. Sky News correspondent Enda Brady, 38, from Watlington, completed the race in three hours and 56 minutes. He raised more than £1,500 for Concern, an Irish charity helping to feed children from the Syrian refugee crisis. The total included the proceeds of a raffle of sports memorabilia including football shirts donated by Chelsea FC players Frank Lampard and John Terry. Watlingtons newest parish councillor also took part. Liz Winton, 40, of Court Close, finished in three hours and 56 minutes. She was running for Save the Rhino and raised more than £2,000. Mrs Winton, who was co-opted on to the council last week, runs a jogging club in Watlington and runs four or five times a week.